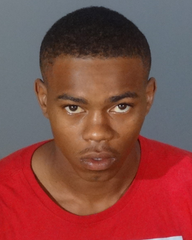 A 19-year-old Los Angeles man was arrested at his residence early this morning and booked at the Arcadia City Jail on suspicion of Residential Burglary. The burglary occurred a few weeks ago on Estrella Avenue in Arcadia. Detectives identified Anthony J. Harris as a suspect in the Arcadia burglary and a search and arrest warrant was obtained. Harris has previous felony arrests for burglary, robbery, was believed to have access to weapons and has gang affiliations. The Arcadia Police Department Special Weapons and Tactics Team, along with Detectives served the warrant at Harris's Los Angeles home early this morning and arrested Harris without incident. Anyone with information on this incident or similar incidents is encouraged to contact the Arcadia Police Department at 626-574-5156. Or, if you wish to remain Anonymous, call “LA Crime Stoppers” by dialing 800-222-TIPS (8477), use your smartphone by downloading the “P3 Tips” mobile app on Google play or the App Store, or by using the website http://lacrimestoppers.org.